Momonga was just a regular guy who plays the D-MMORPG (Dive-MMO, a VR game) Yggdrasil, until after 12 years the servers are quietly shut down. But, with a deep love for the game, he stays logged in until the very end, when he is suddenly transported into a new world that is just like the game. With nothing to go back to in his original world, he uses his immense power to spread the name of his guild, Ains Ooal Gown, in the hopes of finding other players who may also have transported over. 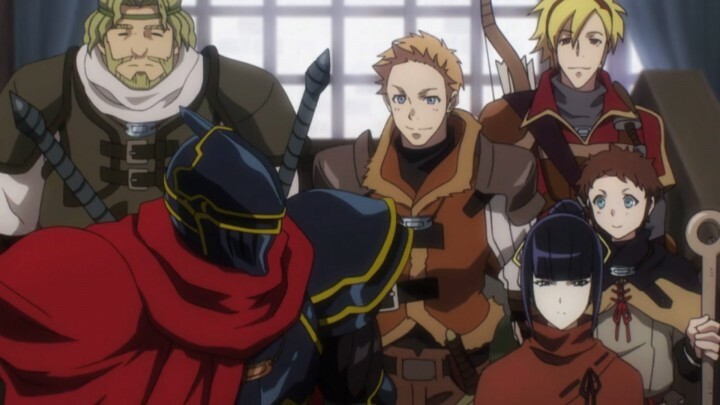 Overlord is yet another anime in the growing sub-genre of “trapped in a VRMMO”. However, unlike other shows like Log Horizon and Sword Art Online, the main character Momonga — who calls himself Ains in the new world — actually welcomes his predicament and seeks to further root himself in this new life. Also, Ains is absurdly powerful, as he used to be an extremely high level player from Yggdrasil. He’s so overpowered in fact, that there’s not much of anything to challenge him. Because of this, Ains — and the anime as a result — never really goes all out. There’s a lot of untapped potential to be had with its characters and lore, but it feels like it’s still warming up even by the season’s end. While it still has its moments, hopefully future seasons can really show off how expansive Overlord‘s fun can be. The first two episodes focus on showing how personal the game of Yggdrasil is to Momonga, and contrasting the rules of the original game with the new world’s more unrestricted setting. Some things still work like they used to in the game — such as items and magic — but others don’t, like admin tools and NPC settings. It’s a slow but necessary start, if only to set the audience’s expectations of what kind of world Momonga has been transported to and how he’ll adapt. Watching Momonga struggle to maintain his ruler persona is quite amusing. Momonga himself is interesting in that he, unlike other VRMMO anime protagonists, takes effort to fulfill his avatar’s role play, which is quite different from his real life personality. In real life Momonga was a Japanese salaryman, with a somewhat meek and awkward yet kind and loyal personality. In Yggdrasil, he was the confident and ruthless leader of the top guild called Ains Ooal Gown, full of elite players. With his guildmates, he built the Great Tomb of Nazarick as their base — a vast, multi-floored labyrinth housing some of the most powerful items and NPCs. This giant structure was also transported to the new world, and Momonga is now suddenly the sole voice of authority within it. 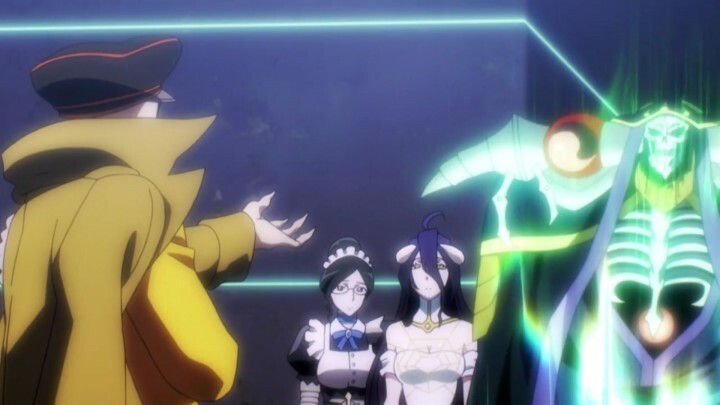 His subjects are the formerly AI-controlled floor guardians of Nazarick, who are now all independent beings in the new world. Watching Momonga struggle to maintain his ruler persona in front of them is quite amusing, especially since he sometimes breaks character for a split-second when surprised. The following episodes set out to establish the world outside of Nazarick, as well as the huge power gap between Momonga and everyone else. As knights attack a village of the Re-Estize kingdom, Momonga uses it as an opportunity to test his combat strength. He more than easily makes quick work of them, commenting on how little effort he needed to do so. It’s clear that there is much more for him to show off, and this anticipation is what keeps interest in these otherwise uneventful first few episodes. Episode four is where we finally get a semblance of battle. 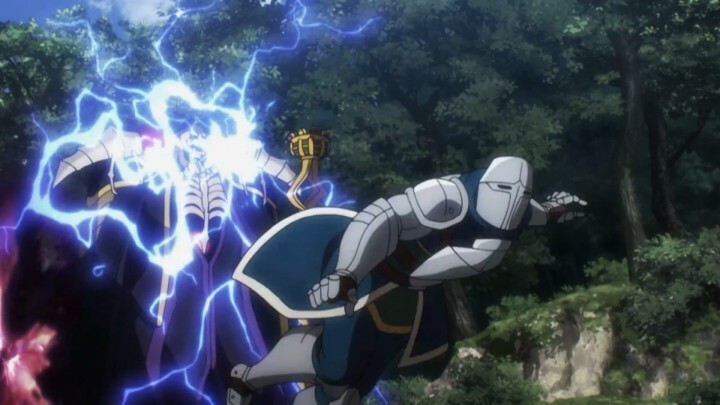 Gazef, the kingdom’s royal head knight, attempts to drive off the attackers single-handedly. Overlord spends some time letting him shine as he fires off skill after skill, rampaging through enemy hordes. It’s a visceral and well-animated sequence that gives us our initial point of comparison for character strength. With Gazef now anchoring how a “strong” character should perform, Momonga — now calling himself Ains — steps in and blows everything away. As a max level character with god tier abilities, he shrugs off an opponent’s ultimate skill as if it was nothing. He doesn’t strain himself at all as he one shots everything, and there’s a certain satisfaction from watching him be so dominant. Now that there’s a sense of his power, the anticipation is now seeing how he can even be challenged. So far, Overlord is a pretty simple show without anything original. But the pieces that make up the show and the hope of seeing these pieces used further works as enough of a hook to keep interest. It’s just unfortunate that there’s no meaty overarching plot to really tie all of the fun elements together. Without a proper climax to look forward to, you just have to be content with watching Ains enjoy himself as he explores the world like a gamer reaching the next level. 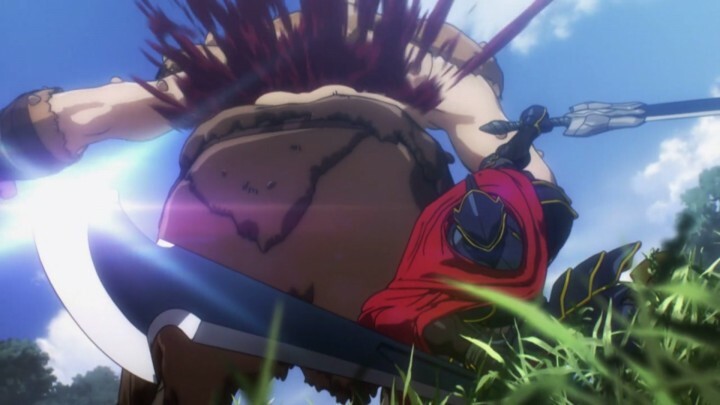 After blasting away the village attackers, Ains goes undercover as the black-armored adventurer Momon with one of Nazarick’s former-NPCs, Nabe. He wants to find out more about this new world quickly, and decides that the fastest way to do so is to join a guild and rise through its ranks. This setup leads to quite a bit more detail about basic society, a guild’s function and rankings, adventurer responsibilities, and party roles — which are all mostly generic RPG standards. If you’ve played any kind of fantasy RPG, then there’s not much to be intrigued by. The source of entertainment instead comes from watching Ains try to fit in and suppress his true capabilities. By now, it seems like most characters serve only to create an initial sense of danger due to their lower skill level, only for Ains to completely destroy any opposition. When fighting a gang of ogres and goblins, Ains’ new adventurer friends use everything they have to coordinate a battle strategy…as Ains effortlessly cuts through them without even using his magic. I started to wonder if there’s anything that can even make Ains exert himself at all, and honestly was getting a bit bored at this point. Overlord‘s tone gets a bit darker here as the story ups the tension with some gruesome deaths. The light-hearted adventuring and party banter is replaced with psychotic villains and a more serious Ains — a rare sight. We’re introduced to two possible challengers to Ains and crew: Clementine, a crazy assassin, and Khajit, a necromancer. Like Gazef, they’re hyped up as top tier fighters who have a chance to make Ains work a little. However, as much as Clementine is talked up to be an elite assassin — by herself and others — Ains more than easily overcomes her with a self-imposed handicap. Nabe just as easily takes out Khajit, and she’s supposedly one of his less-powerful followers. Battles are just too predictable in how they play out, and I started to itch badly to see Ains at least hesitate in battle. 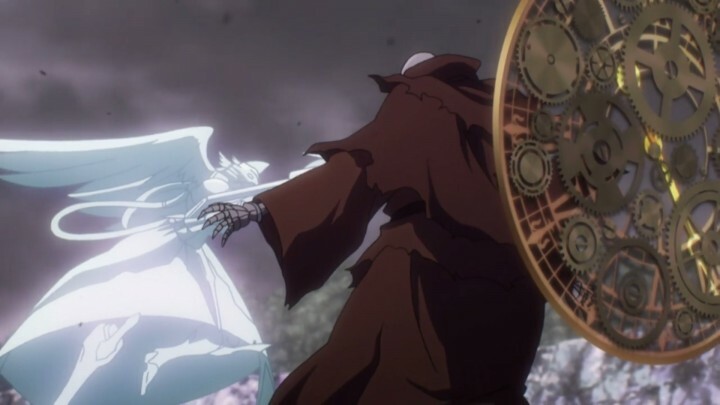 I understand that Overlord‘s point is to be a power fantasy, but if Ains is going to crush every single enemy easily, the anime needs depth in other areas to be more engaging. It’s enjoyable to see the reactions of the villains. Even if the battles themselves aren’t as exciting, it’s enjoyable to see the reactions of the villains as their extreme cockiness quickly turns to shock and desperation. 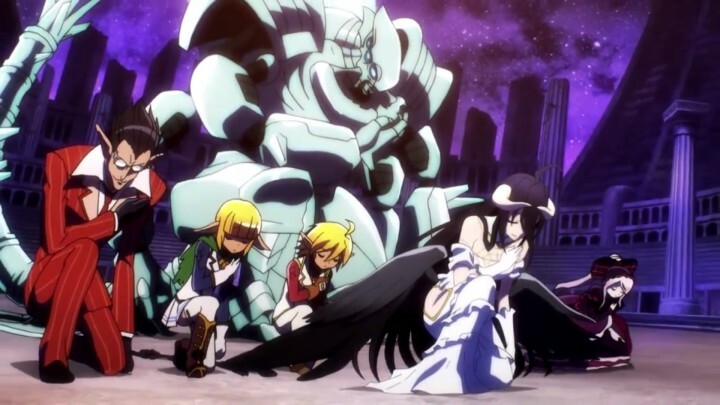 If anything, Overlord pulls this off well, as the bad guys can clearly see the giant chasm between themselves and Ains, and their mental switch is fun to watch. These are probably my favorite episodes of Overlord, mostly because Ains actually has to sweat a little. 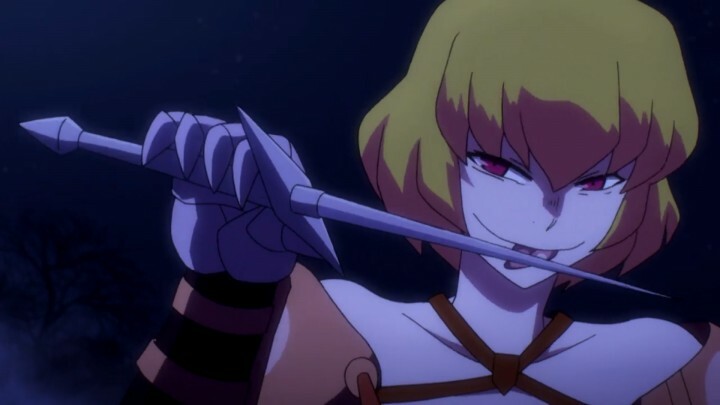 The story arc first starts with Shalltear, one of the floor guardians, getting an episode to establish her strength and twisted personality. In typical Overlord fashion, she toys with one of the kingdom’s strongest warriors like he was nothing — no surprises there at this point. What is intriguing though is that a group of adventurers somehow puts her under mind control, resulting in her revolting against Ains. This is a welcomed development because it always seemed like the only characters that could challenge Ains at all were the inhabitants of Nazarick themselves. As a side note, throughout the entire anime I’ve thoroughly enjoyed it when Ains thinks to himself as his real world self. It’s amusing to see how he tries so hard to put on a facade in front of others, but still has moments of spontaneous emotions — whether through embarrassment, anger, or delight. It humanizes him and makes him relatable beyond just being an untouchable powerhouse. 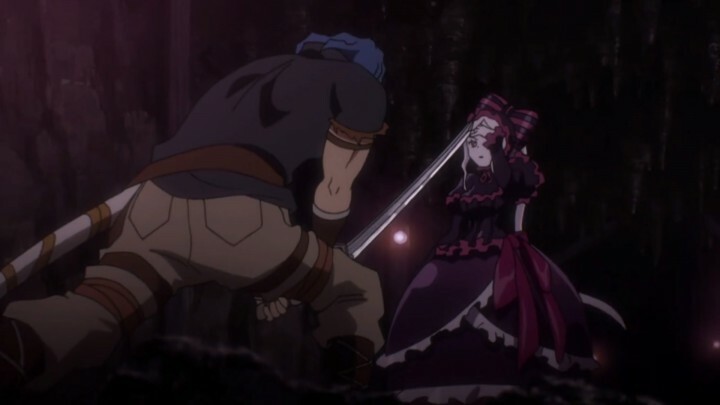 Back to the Shalltear situation, Ains finally gets serious, and even the other guardians believe that the odds are actually against him. The climactic battle rages with flashy spells hurled one after another, with counters against counters as each side tries to outwit the other. 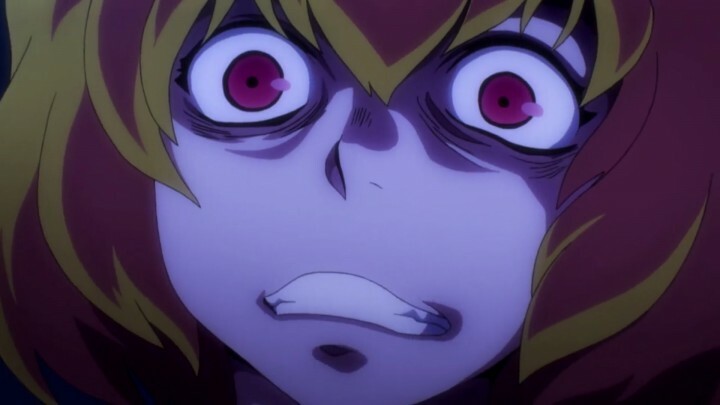 Ains and Shalltear both push themselves pretty hard, and I was happy to finally get a glimpse at what they can really do. Of course, Ains wins in the end, but it’s through clever planning and not simple brute force. 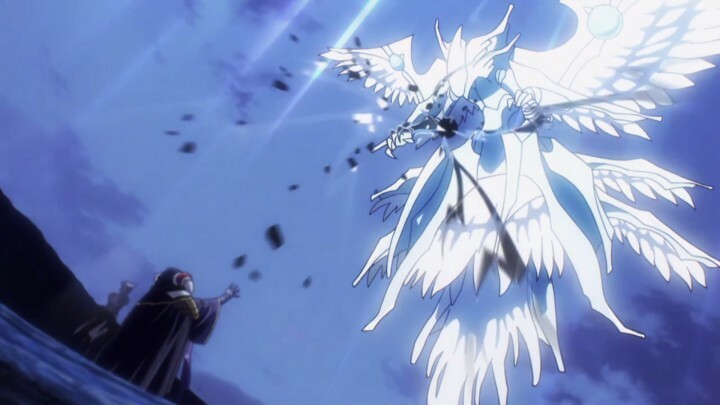 Honestly, I was glad that Ains didn’t simply pull out some crazy deus ex machina super attack to finish things — well, he kind of does, but it makes sense in the anime’s world and doesn’t come off as a cop-out. Also, an unexpected parody of MMO game mechanics really makes the battle a memorable one. I can’t help but feel like I only had an appetizer. Ultimately, Overlord ends with a bunch of teases for a possible second season. There are still so many things left to explore: the other floor guardians’ abilities, the secret plot of a neighboring country, and the looming threat that has Ains mobilizing everyone at Nazerick. I feel like this anime really has a lot going for it, because it doesn’t try to hide what it is behind philosophical quandaries or ambiguous moral questions — it’s just meant to be a fun adventure and plays to that very well. But I can’t help but feel like I only had an appetizer and am still waiting for the main course. Here’s hoping that there’s more Overlord to come, so we can get a full taste of what looks to be a fulfilling experience.